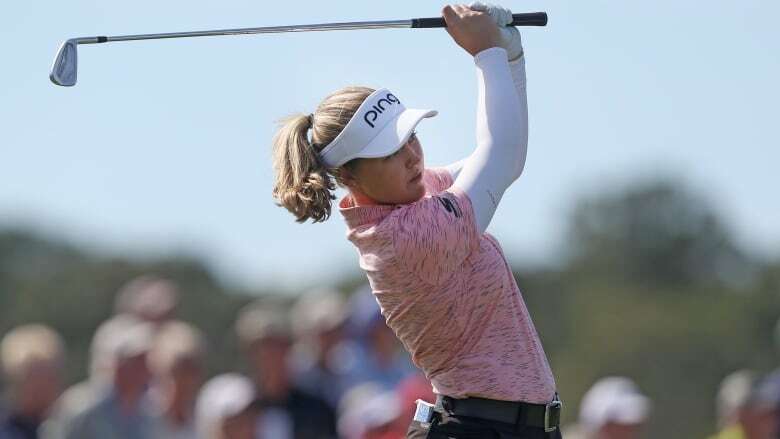 Brooke Henderson of Smiths Falls, Ont., was poised to make it a three-way tie at the Diamond Resorts Tournament of Champions until she made bogey on the par-3 closing hole for a 69. Lydia Ko shot 30 on the front nine to catch the leaders and stayed bogey-free Saturday for a 5-under 66 to share the lead with Eun-Hee Ji going into the final round of the Diamond Resorts Tournament of Champions in Lake Buena Vista, Fla.
Brooke Henderson of Smiths Falls, Ont., was poised to make it a three-way tie at the top until she made bogey on the par-3 closing hole for a 69, leaving her one shot behind. Nelly Korda had an eagle and four birdies for a 65. She sits two shots off the pace. The LPGA Tour season opener is limited to winners each of the last two seasons for a $1.2 million US purse.